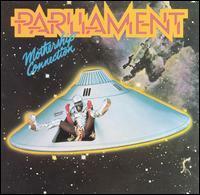 Mothership Connection is the fourth album by American funk band Parliament, released on December 15, 1975 on Casablanca Records. This concept album of P-Funk mythology is usually rated as one of Parliament's best. Mothership Connection was the first P-Funk album to feature Maceo Parker and Fred Wesley, who had left The J.B.'s, James Brown's backing band. "Mothership Connection" became Parliament's first album to be certified gold and later platinum. The Library of Congress added the album to the National Recording Registry in 2011, declaring "[t]he album has had an enormous influence on jazz, rock and dance music." Describing the album, George Clinton said "We had put black people in situations nobody ever thought they would be in, like the White House. I figured another place you wouldn't think black people would be was in outer space. I was a big fan of Star Trek, so we did a thing with a pimp sitting in a spaceship shaped like a Cadillac, and we did all these James Brown-type grooves, but with street talk and ghetto slang." Dr. Dre prominently sampled the songs "Mothership Connection (Star Child)" and "P-Funk (Wants to Get Funked Up)" on his album The Chronic. In 2003 the TV network VH1 named Mothership Connection the 55th greatest album of all time. In 2003, the album was ranked number 276 on Rolling Stone magazine's list of the 500 greatest albums of all time. Rolling Stone (5/1/03, p. 59) - 5 stars out of 5 - "The masterpiece, the slang creator, the icon builder, the master narrative--or 'the bomb,' as Clinton succinctly put it before anyone else." Vibe (2/02, p. 87) - Included in Vibe's "Essential Black Rock Recordings". Art Direction and Design by Gribbitt! ^ a b c "Parliament’s 1975 LP Mothership Connection revisited with Bernard Worrell". Soulculture.com. Retrieved 2015-02-24. ^ "Registry Choices 2010: The National Recording Preservation Board (Library of Congress)". Loc.gov. Retrieved 2013-07-14. ^ Niesel, Jeff (2013-06-26). "Cleveland - Music - Turn This Mutha Out". Clevescene.com. Retrieved 2013-07-14. ^ "Review: ''Mothership Connection''". Superseventies.com. Retrieved 2013-07-14. ^ "Consumer Guide: ''Mothership Connection''". Robertchristgau.com. Retrieved 2013-07-14. ^ Bowden, Marshall. "Review: ''Mothership Connection''". Popmatters.com. Retrieved 2013-07-14. ^ McEwen, Joe (March 25, 1976). "Mothership Connection | Album Reviews | Rolling Stone". rollingstone.com. Retrieved 13 November 2011. ^ Review: ''Mothership Connection''. Books.google.com. Retrieved 2013-07-14. ^ "Review: ''Mothership Connection''". Acclaimedmusic.net. Retrieved 2013-07-14. ^ "Review: ''Mothership Connection''". Sputnikmusic.com. Retrieved 2013-07-14.